People will tell you that Wonder Woman is the best DCEU movie so far, and that’s true. People will tell you that Wonder Woman is the best female-led superhero movie of all time, and that’s also true. But Wonder Woman doesn’t need any of those qualifiers — Wonder Woman is a genuinely good movie in a way that’s refreshing. Similar to Logan but also totally different — it told a classic superhero action story in a movie that was not a typical superhero action movie, and yet the superhero action came through in spades. This is my favorite movie of the year so far (sorry, Guardians vol 2, you were good, but not this good), and top 3 of the past few years. If this is what we have to look forward to with the DCEU going forward, then we shouldn’t have anything to worry about. I give this movie 9/10, and you should pretty much drop what you’re doing to go see it. As promised, here is the review of the prequel to The Book of Deacon Trilogy and all I can say is that it is one of those rare things. A prequel that is leagues better than the original series. However much I may have enjoyed the Deacon series I enjoyed Rise of the Red Shadow more. In this novel we follow Lian as he becomes the famed assassin that we all knew from the original series. We get a brilliant view into the history of the story as well as a great action and emotion packed set up for one of the best characters in the series. So I have just finished the Book of Deacon Trilogy by Joseph Lallo. All in all I enjoyed it hugely. It was a nice quiet light fantasy with all the favorite magical elements, Dark, Light, Grey, Elemental, a little bit of Healing and some scary crystals and really bad dudes. I feel that it was a good solid trilogy that makes a nice filler between heavy series or just a nice holiday series when you don’t want to think too much. You can just read the story and let the events unfold in front of you. There were some issues with the series but I will get into that in a little bit! The characters are all mostly likable (Ether being the exception) and even though the bad guys are truly evil, one can’t really hate them. They are all simple characters that are easy to understand (maybe a little to simple but…) and in the case of Myranda and Deacon, easy to get behind. You feel for her point of view about the war and about what it has done to her homeland. This being the driving factor for her as a Chosen. Personally I rather liked Leo/Lian, he was for me the most well drawn character and the one that I felt that the series could easily have been based more on (on a side note I am looking forward to the prequel Rise of the Red Shadow as it follows Lian). He was certainly the most complex character, with his past as a slave and career as a famed assassin turned reluctant hero. But I may be a little ahead of myself! I have not even told you what the series is about… shame on me! Let me put that right, right now. There are two countries, the Northern Alliance and Tressor. They have been at war for about a hundred and fifty years… During that time things have gotten a little out of hand with evil beings from another set of worlds having come through a portal and slowly setting themselves up to take over this world as well. The only issue is the Chosen, Five heroes that were touched by the gods and made for the purpose of protecting the world. So the story starts as we follow the Chosen as they find each other an slowly all agree about what needs to be done. We have have Ivy, Myn, Leo/Lian, Ether and Myranda. There is a short scene in X-Men: Apocalypse that sees several of the new characters discussing the quality of the films in the original Star Wars trilogy, all of them agreeing that the third film is always the worst. It’s an obvious piece of meta-commentary on the original X-Men trilogy that takes a shot at X-Men: The Last Stand while praising director Bryan Singer’s original two films, which is gaudy enough on its own – but those paying attention will remember that X-Men: Apocalypse itself is the third film in this new timeline. Is this just a staggering lack of self-awareness, or a direct acknowledgement from the film-makers that they’ve badly messed up? It really doesn’t matter. X-Men: Apocalypse is a bad film all the same. The story this time sees the various characters we’ve been following over the last couple of X-Men films reunite in order to try to stop an ancient mutant named Apocalypse and his four horsemen from taking over the world. 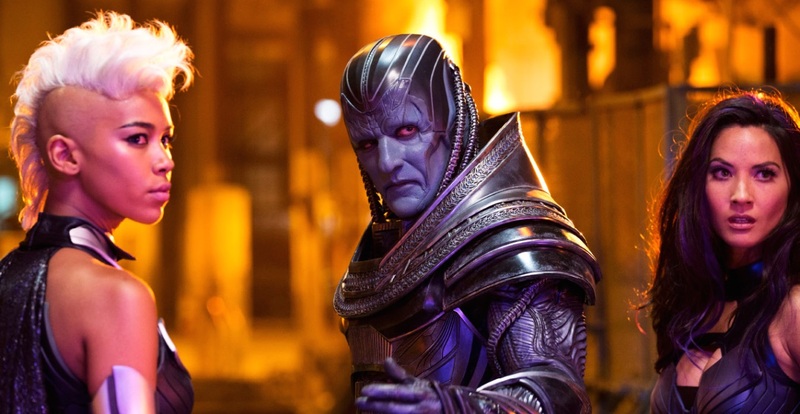 It’s a simple tale of good vs bad basically, far removed from the more soap-operatic, character driven drama of the previous films in the franchise, and unfortunately X-Men: Apocalypse suffers for it.